Includes Free Digital Download Code Of The Entire Album + 72 Page Digital Book! Just as the hippie era came to an end in America, a second 60s was beginning. In what is now Zimbabwe, young people created a rock and roll counterculture that drew inspiration from hippie ideals and the sounds of Hendrix and Deep Purple. The kids in the scene called their music “heavy,” because they could feel its impact, and it resonated from Zambia to Nigeria. At its peak in the mid-70s, the heavy rock scene united tens of thousands of young progressives of all racial and social backgrounds. The country was called Rhodesia then, one of the last bastions of white rule in Africa, and heavy rockers defied segregation laws and secret police to make a stand for democratic change. 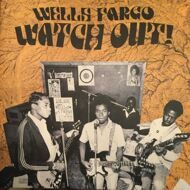 Wells Fargo was at the forefront of the scene, and the title track of this album, Watch Out, was the anthem of the counterculture. This is the first time their music has been issued outside of Zimbabwe. Matthew Shechmeister tells the story of Wells Fargo drawing on interviews with the band's remaining members and numerous trips to Zimbabwe to investigate the genesis of the heavy rock scene under Ian Smith's oppressive government, and its dissipation after Zimbabwe's liberation. Never-before-published photographs and rare ephemera color the vibrant era of which this band was part. Bundled with a download card for WAV files and 72 page digital PDF that details the history of Zimbabwe’s heavy rock scene and the trajectory of Wells Fargo.